Grow Communication is a non-profit organisation based in Scotland. 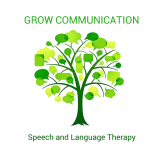 Jude Philip and Katy Bennet founded Grow to bring innovative, specialist Speech and Language Therapy to individuals with communication difficulties. Multi-disciplinary Autism Diagnostic Assessments with clinical psychology using ADOS and DISCO**. Katy and Jude both have a special interest in AAC for all with complex communication needs. We #presumecompetence and offer a range of AAC options including PODD, Aided Language, eye-gaze, high tech apps. We have additional specialist training in Motor Speech Difficulties including Dysarthria (associated with cerebral palsy – Jude is LSVT trained) and Developmental Verbal Dyspraxia/Childhood Apraxia of Speech. Selective Mutism – especially where it is associated with Autism. We strive to help people reach their potential – through careful assessment, tailored therapy, problem-solving, coaching and team-working. We work closely with you to choose goals that are meaningful. Whilst other agencies may be limited to working in schools we are free to work closely with parents/ carers/ other agencies as I believe this is key to success. We offer Specialist SLT and consultancy services across Scotland as required. We also travel to England for focused pieces of work. We also consider international clients and can travel to you, as well as support remotely (via SKYPE). All support is tailored to your individual circumstances and any travel costs are agreed before first visit. We cover West Lothian, Falkirk, Stirling, Clacks, Edinburgh, Midlothian, East Lothian, Lothians, Perth and Kinross, Fife, Greater Glasgow, Lanarkshire, Borders.